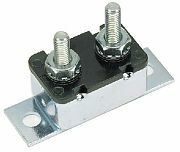 Internal mounting bracket. Overall size 2" x 25/32" x 1-3/8". For 6, 12 and 24 volt applications. Complete with two #10-32 stud terminals, and keps nuts. Blister packed.